A Christ-centered community church with a warm, welcoming atmosphere and activities for every age. Interested in getting involved in missions, Christian education, small groups, or music @Immanuel? Want to dig deeper throughout the week? Check out the devotional resources, Pastor TJ's podcasts. Hospitality Counter between services, every Sunday. 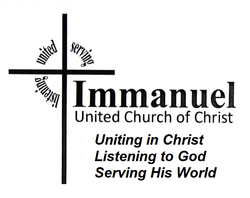 (previous messages podcasts are available at www.ucc-immanuel.org under Listen to Sermon tab or available on itunes.